A Season for Sin was a great read and goodness what a gorgeous cover! I really enjoyed Dreiling's writing style which quickly pulls you into the story and has a very nice flow. I was quite taken with Bell and Laura as well. They're interesting characters that easily captured my heart and left me both curious and eager to read more about them. Bell is one of those men who likes order, routine and knowing exactly what's going to happen in his life. And that life is definitely not going according to his well laid plans what with mistress troubles, being dumped by his cook and a lovely new widow in town catching his eye. It's going to be deliciously entertaining getting to see how he reacts to a bit of chaos in his life now that he's encountered the lovely widow Laura Davenport. Laura really pulled at my heart in such a brief amount of time. She's completely devoted to raising her stepson who has gone a bit wild and hit those years where he wants nothing to do with her. Her loneliness and the loss she still feels over her husband's passing were heartbreaking. It'll be interesting to see how she handles her stepson's rebellion, the scoundrel that is Bell and her new life in London. 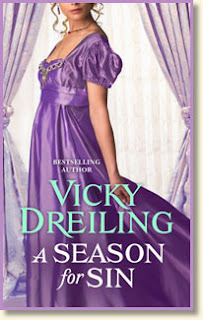 A Season for Sin was a great set up for Dreiling's future series and an enjoyable read. Dreiling did a fantastic job of introducing Laura and Bell, letting us see their quirks and what makes them tick as well as seeding the way for some future family conflict that looks interesting. I liked both Bell and Laura quite a bit and can't wait to spend more time with them and see what will develop between them. What do you think about "introduction to series" novellas? Do you like cliff-hangers or do you like an ending to each of your stories? Have you read Dreiling? Have a favorite character/book/scene?